In partnership with AAPI Civic Engagement Fund, Asian & Pacific Islander American Health Forum (APIAHF), the National Association for the Advancement of Colored People (NAACP), the National Urban League, and Unidos US, among others, 2600 voters of color were surveyed in the days leading up to the November 6th election in six battleground states, including California, Florida, Georgia, Texas, Nevada and Arizona. 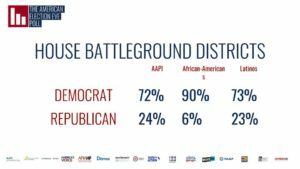 Results of the survey convincingly show that Asian American and Pacific Islander voters, along with Black and Latinx voters, voted overwhelmingly in favour of the Democratic party, and that these votes helped propel Democratic candidates to victory. According to the poll, 72% of AAPI voters, 73% of Latinx voters, and 90% of Black voters voted for Democratic candidates in key House races. In total, 70% of AAPI voters — regardless of what district they were casting a vote in — voted for Democrats. A separate poll reported on in the Washington Post also found that 77% of Asian American voters cast their votes for Democratic candidates. These numbers are a clear rebuke of the race-baiting and nativist rhetoric and policies of President Trump and the Trump administration. According to the poll, two-thirds of AAPI voters strongly disapprove of President Trump, a finding that is similar to the results of a poll conducted by a different group and that sampled AAPI voters in 2016. Furthermore, nearly one-third believe that Trump has had a demonstrably negative impact on Asian Americans. In California, 74% of AAPI voters voted for Gavin Newsom and in Texas, 66% voted for Beto O’Rourke, the progressive candidate who sought to unseat Senator Ted Cruz. In Florida, 73% of AAPIs cast their vote for Democrat Andrew Gillum in the state’s hotly-contested gubernatorial race that is currently undergoing a recount, and 72% of AAPIs voted for Democratic challenger Bill Nelson for Rick Scott’s Senate seat. In Georgia, 69% of AAPIs voted for Democrat Stacey Abrams for governor. 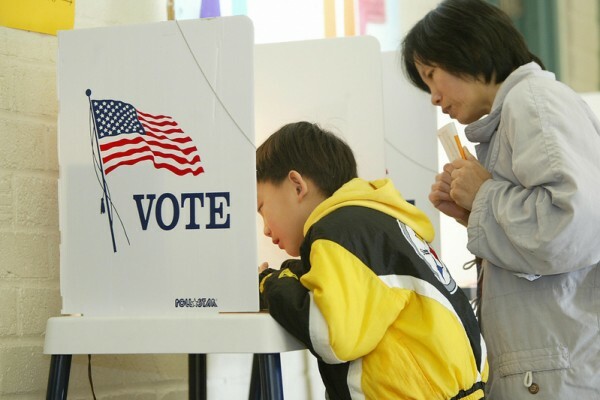 In many of the above races, the number of Asian Americans casting votes for Democrats outnumbered the margin of votes between the Democratic and Republican candidates. American Decisions also polled AAPI opinions on key issues. The vast majority of AAPI respondents support stricter gun laws (79%), the Affordable Care Act (71%), the DREAM Act (75%), equal pay for women (89%) and affirmative action in higher education (59%). Asian Americans are the fastest-growing racial group in America, and a UCLA study predicts that the size of the electorate will double by 2040. Last week, I reported that the number of Asian Americans elected to Congress is likely to increase after last week’s Midterm elections.